Koro Sun Resort, located on Savusavu, welcomes Fiji visitors from the world over, offering the incomparable, traditional Fijian hospitality that makes the island nation a true paradise. From romantic holidays and unforgettable honeymoons to family vacations, the Koro Sun Fiji Resort and Rainforest Spa offers something for everyone. Located on the northern island of Vanua Levu, Koro Sun Resort lies on over 150 acres of Fijian rainforest, making it a true Fiji breakthrough getaway. At Koro Sun Resort all-inclusive packages are available to all visitors, including gourmet meals, Fiji resort activity such as snorkeling, kayaking and hiking as well as additional adventures such scuba diving, surfing and deep sea fishing. Resort accommodations offer privacy to all “temporary Fijian residents,” in traditional Fijian Bure style lodging, or the choice of luxury villas boasting multiple bedrooms and impressive amenities. Koro Sun Resort will be your introduction to life at the very best of Fiji’s all-inclusive resorts. Whether honeymooning or traveling to Fiji with your family, 30 beautifully decorated, contemporary Fijian style bures offer privacy and exclusive accommodations with pleasing shades of luxurious perfection. Garden Bures: The Garden bures are surrounded by lush tropical gardens with a white picket fenced veranda. These bures are spacious with one king bed, bamboo canopy frame, palm wood furniture, complete with romantic stone shower. Your bure includes a private walled courtyard in back, and are perfect for a couple. The bures feature air conditioning. Edgewater Villas: The Edgewater Villas are located partially over the water, on the Koro Bay lagoon. You’ll enter the 2 story villa through a private garden with your own swimming pool, sundeck and bridge over the pool. The lower level includes a relaxing living area furnished with soft leather and palm woods, complete with a full kitchen, dining room, media room with flat screen TV & DVD player, and a full bath. The leather couch in the media room is equipped with a fold out bed. Right off the living room you can access the ocean from your deck with ladder to Koro Bay. The whole second floor is the master suite with a king sized bed, leather lounge, and private rooftop deck overlooking Koro Bay lagoon. Luxury Villa Collection: The Koro Sun luxury villas are located in their master-planned, Fiji resort community, high on a rainforest hillside, overlooking the Koro Sea and the beautiful Fiji resort below. Each villa has multiple bedrooms, a designer kitchen, grand view living rooms, a refreshing plunge pool, spacious outdoor verandas, complete with beautifully appointed tropical furnishings. Steal a smile when you consider your Fiji vacation amenities! The luxury villas come fully furnished with refrigerator, cooking facilities, DVD & CD player with available CD collection, hairdryer, Pure Fiji Rainforest Spa products, iron/ironing board and tea and coffee facility. Guests are welcome to use all non-motorized vehicles of the resort, such as kayaks and bikes, offering instant access to great Fiji adventures. Guests will certainly enjoy the housekeeping services, free airport transfers and all-inclusive meals at our luxury restaurants. (Subject to change) For something truly special on your Fiji vacation, private chefs from the resort are available for a wide range of culinary desires and in-villa dining, at an additional charge, the perfect option for a quiet romantic evening. Koro Sun has many other available Bure categories in between including the new Floating Overwater Bures! All meals and non-motorized water sport activities are also included, so the world outside is yours to discover. 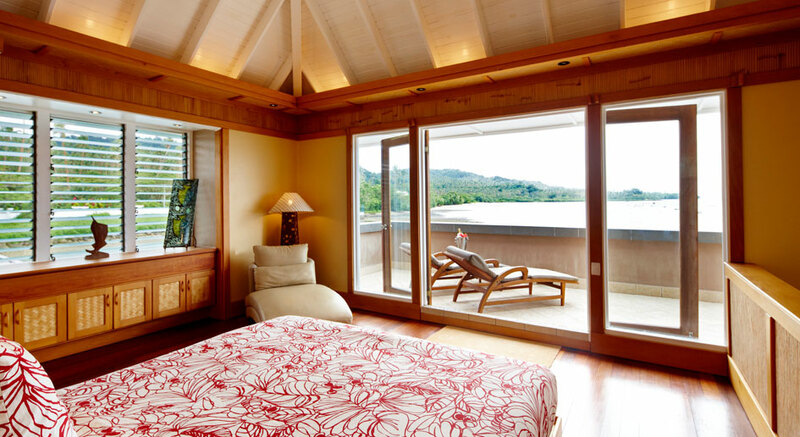 This 150-acre private, Fiji resort offers a welcome retreat from the busy world. With the Luxury Villa Collection at Koro Sun you have the option of including your meals or hiring a private chef! It is true that a Fiji island vacation would be incomplete without a few incredible dining experiences. The Koro Sun Resort wishes to ensure that every dining experience is made memorable. The staff works hard to perfect the menus and recipes to provide you with unique and delicious selections of International flavors over the course of your Fiji resort stay. When special occasions or circumstances arise, the staff are happy to offer private dining in your bure or by candlelight on the beach. In fact, Koro Sun Resort Fiji Honeymoon Packages will help you celebrate your marriage by creating your vision of the perfect intimate encounter. Whatever you desire, they can make it happen. Chefs look forward to meeting you during your stay and are happy to accommodate any special requests or dietary requirements. The views from Koro Sun will leave you breathless. From the lush, verdant rainforest, to the azure lagoons and reefs beyond, this Fiji Island resort offers the ultimate site for a romantic wedding ceremony. Exchange vows by candlelight in our over the water pavilion, or on a grassy knoll overlooking the reefs and rain forest. Share a wedding kiss at sunset or a shorefront ceremony at sunrise. Stand aside a rushing waterfall, or under a gorgeous full moon glimmering across the South Pacific waters. If you’d love to bring traditional Fiji into your wedding ceremony, consider walking down a finger lit land extending across a blue lagoon, escorted by Fijian warriors. Perhaps you’d like to arrive by sea, on a traditional Fijian bamboo raft. When you choose to wed in Fiji at Koro Sun, you’ll have more than a few incredible options from which to choose. Weddings at Koro Sun Resort and Rainforest Spa take on a special meaning, not only to wedding couples who choose to start their new life together at the resort, but also to the special staff who make sure each moment is a treasured memory. A champagne toast, a dance under an expansive, starry night sky – they create unique ceremonies and romantic interludes from a casual, barefoot wedding ceremony for two, to a tropical Fiji soiree for 52. The experienced Koro Sun Resort staff will help you start your Fiji adventures off on the right foot. You’ll love exploring the many acres of beautiful rainforests in search of wildlife, gorgeous natural waterfalls and lush native plants. The waters surrounding our Fiji island resort are perfect for snorkeling, Fiji sea kayaking and even enjoying a Fiji diving adventure. Spend your day lazing on the daybeds at the water’s edge, exploring the offshore reef with our PADI certified crew, fine-tuning your putting on our nine-hole pitch and put rainforest golf course or indulging in a banana leaf body wrap or coconut oil massage in our enchanting Rainforest Spa. Our adventure team will also personalize experiences away from Koro Sun. Explore Lotu Island Cave with Manu, tour botanical gardens with Leba or hike with Jone to a tumbling waterfall where you can splash in the cool pools beneath. A few of the complimentary activities that are available at Koro sun are; a guided herbal walk through Koro sun’s botanical gardens, a village and school visit, cycling on Hibiscus road, tennis, volleyball, a fun pitch-n-putt golf course, kayak across to Bat Island, hand line fishing, and lawn games. Scuba diving, surfing, stand up paddle boards, kayaking on the Salt River, private beach escapes and visits into Savu Savu are available at an additional rate. The trickling streams and calling birds are some of the sounds you’ll hear during your coconut-oil massage, in the lush Fijian jungle surrounding the Rainforest Spa. And the detoxifying bindings that swaddle you during your body wrap come from the banana trees in our resort’s own grove. Even the coconut shavings used to polish and exfoliate your skin in the Sensational Scrub are gathered from a nearby plantation. That’s because everything at Koro Sun Rainforest Spa is as homegrown as possible — from the three treatment bures lighted by candles and lanterns and decorated with giant ferns to the 11 treatments ripe with ingredients like organic papaya, aloe and cucumber. All you have to do while you’re here is sit back, relax — and see, feel, hear and smell the island. Koro Sun Resort and Rainforest Spa is the perfect vacation option for families looking for relaxation and adventure. In fact, the Koro Sun Resort was recently ranked as a Top 10 Best Resorts in Fiji for Children by the Sydney Morning Herald. Whether you have young children, who are easily entertained, or teenagers who are under the belief that they’ve seen it all, the Fiji island resort offers wonderful vacation specials, as well as Fiji adventure options that will capture the imagination of any child. As our valued clients, you will receive a fresh flower lei greeting upon arrival and entrance into Fiji Airway’s Airport first class VIP departure lounge on your last day – when you book your flights and accommodations with us. To request more information please click on the request quote link below.